This Slow Cooker Teriyaki Pulled Pork is fantastic over rice, in tacos with slaw or on hamburger buns. Throw it all in the crockpot and walk away! When you find a great sauce or dressing, it’s worth finding 50 different ways to use it. For us, those sauces are light versions of peanut sauce and teriyaki sauce. The peanut sauce turns pizza night into something amazing when used on this Thai Chicken Naan Pizza or Grilled Thai Vegetable Tacos. And the teriyaki sauce? It’s the star in my all-time favorite Teriyaki Shrimp Tacos (these things are beyond delicious!) and our most requested birthday meal, Baked Teriyaki Turkey Meatballs. And now the teriyaki sauce becomes the perfect sweet and salty sauce for this slow cooker teriyaki pulled pork. This is one of those slow cooker meals that requires almost no work on the cook’s part. Whisk up the sauce, pour it into the slow cooker, add two pork tenderloins, set to LOW and walk away. The pork is done when it starts falling apart when pulled gently with a fork. While shredding the pork, bring the sauce to a boil in a small saucepan, along with some cornstarch, and simmer until slightly thickened. 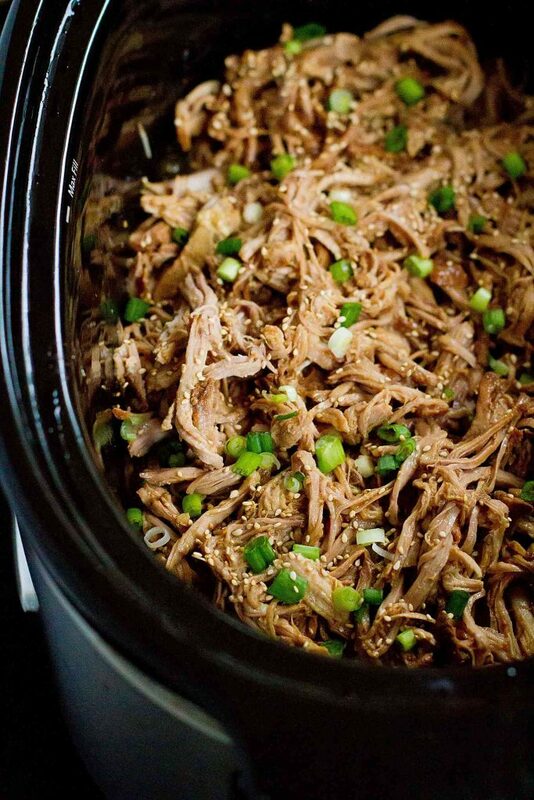 Toss the shredded pork with the sauce in the slow cooker and keep warm until you’re ready to use it. We served the pulled pork on whole wheat hamburger buns and topped it with an Asian-inspired slaw like this one (though we used Trader Joe’s broccoli slaw in place of the cucumber and jicama) and a generous dollop with of chili garlic yogurt sauce, like the one in this recipe. Divine! Alternatively, serve this slow cooker teriyaki pulled pork over rice, alongside stir-fried veggies or in tacos with some of that Asian-inspired slaw and yogurt sauce. It’s so versatile and works just as well for game day snacking as it does for weekday meals. 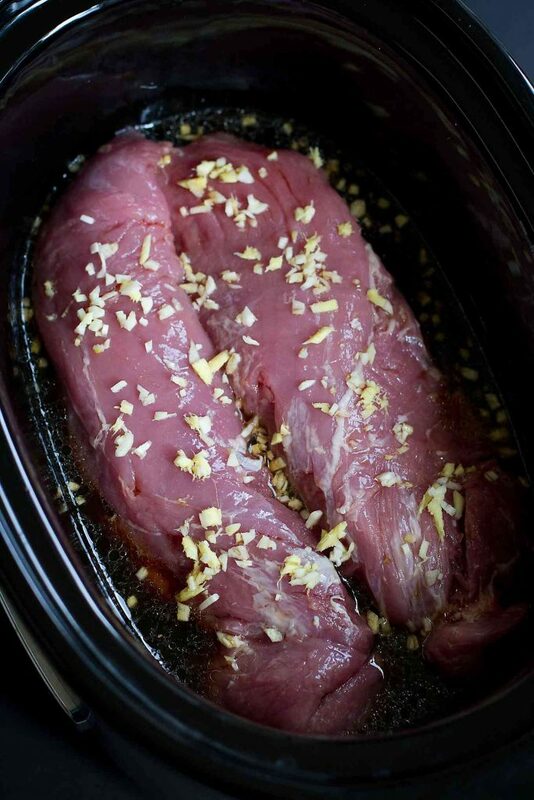 In the bowl of a slow cooker, whisk together the rice vinegar, water, soy sauce, honey, canola oil, ginger and garlic. Add the pork tenderloins and turn to coat with the sauce. Cook on LOW for 6 to 8 hours, or until the pork is very tender and falls apart when pulled with a fork. Transfer the pork to a cutting board. Shred, using two forks or your fingers (if cool enough). Pour the sauce into a small saucepan. In a small bowl, whisk together the cornstarch and water, then add to the sauce. Bring the sauce to a boil over medium heat, whisking frequently. Cook until the sauce is slightly thickened, 7 to 8 minutes. Return the pork to the slow cooker to keep warm and toss with sauce. Serve over rice or on whole wheat hamburger buns. Garnish with sesame seeds and green onions, if desired. I LOVE making pulled pork in the slow cooker. I’ve got to try this teriyaki version!! I am so excited to try this! We love teriyaki chicken but I never tried pork! Sounds perfect! I am so craving this now and I just had dinner! I would love to try it with your slaw…a perfect weeknight dinner idea for everyone here! 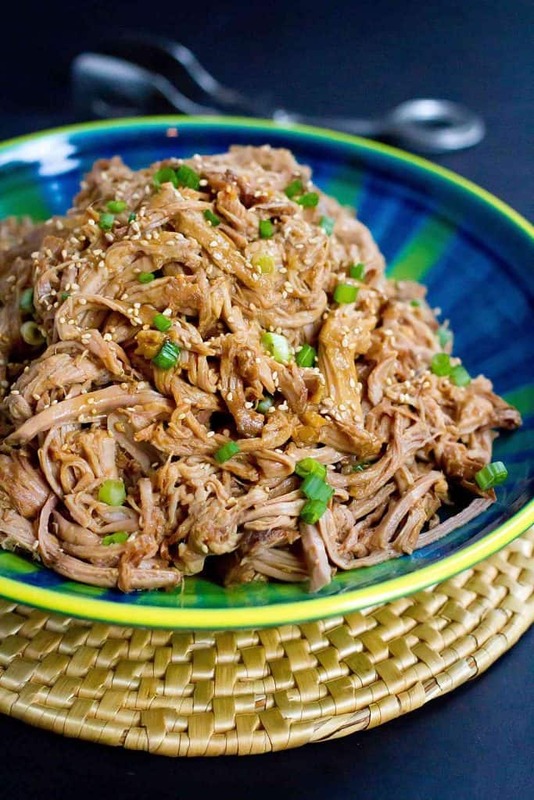 We love pulled tenderloin but so need to try this teriyaki version! This would be great for weeknights during the holidays – I’m so busy I don’t always have time to cook! 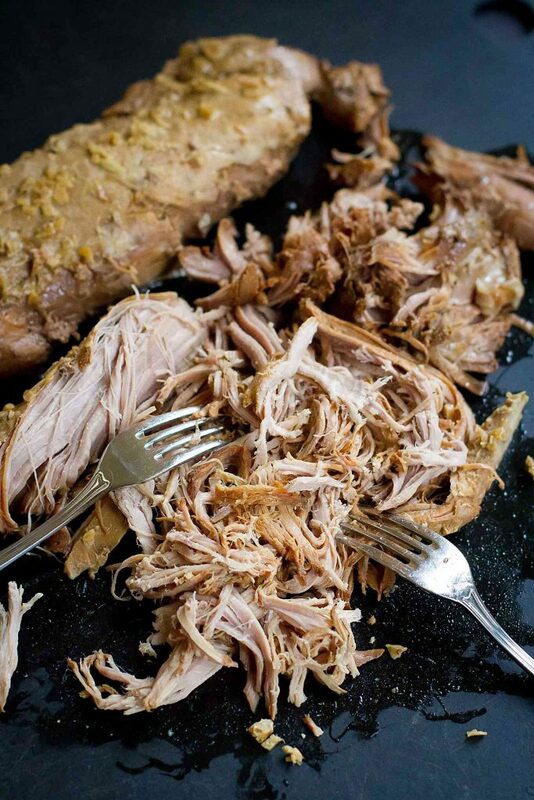 I love making pulled pork in the slow cooker! This one will be great for making my husband sandwiches for work! Hi Deb, sorry about the omission. The honey should be whisked into the soy sauce mixture. The recipe is now adjusted to reflect that. Approximately how big is a serving? A 1/2 cup? Full cup? Hi Danielle, the serving size is 1/2 (it’s notated in the nutritional information panel in the recipe box). I hope you enjoy it!